Invisible Man On Third! (74/365 v2.0) – Annoyingly Boring? 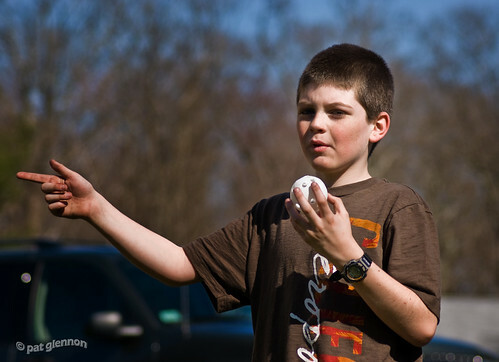 As the weather continues to get warmer rites of spring continue, Wiffle Ball among them. Here, my son gestures towards third base before pitching, as if to remind those playing that there is an ‘invisible man’ on third. The imagination of children is a wonderful thing. We need more of it. Just think how much money could be saved, and how much ticket prices could be lowered if Major League Baseball instituted the Invisible Man method of base running! OK, so that might be a stretch, but kids’ imagination is still priceless. Wow – I had completely forgotten about the invisible man. He [and some of his relatives] were constant childhood playmates on our street though. Thanks for reminding me! C’mon, that’s not Wiffle – that’s just a cheap plastic ball with lots of round holes in it. A genuine Wiffle has eight oblong perforations on just one hemisphere. Click on my link and buy him a genuine Wiffle – it curves! I’d pay to see that. Wait, no I wouldn’t. What’s the right answer here? Eds last blog post..Why the Bows? We always used to do this as a kid when we were lacking a full team for backyard baseball. The best part were the arguments if the ghost runner beat the throw to home.